How do change your mindset when you don’t have a lot of money? Do you constantly tell yourself you don’t have enough money? Or worry about how to pay your bills? That kind of constant stress and negative thinking creates a poverty mindset. And the more you live in this mindset, the more of it you will attract. The truth is it’s impossible to attract abundance from a place of poverty. You have to feel abundant before you can actually attract abundance. So how do change your mindset when you don’t have a lot of money? Thankfully, you don’ have to spend a lot of money to change your mindset. Here are three ways to change your money mindset without spending more. I came across this exercise yesterday in the book Ask and it is Given, Learning to Manifest Your Desires by Esther and Jerry Hicks. You create a virtual savings account. On the first day, you deposit $1,000 of pretend money. Then you got out and spend it all. On the second day, you deposit $2,000. Then you go out and spend it all. On the third, you deposit $3,000. Then – you guessed it – you go out and spend it all. Keep doing this every day, increasing the deposit amount by $1,000, and spending it all. You can do whatever you like with this money. Go online shopping. Figure out what things costs. Pay your bills. Today, I spent $2,000 at my favorite store. I got a tent and some hiking boots and my very own personal trainer. Seriously, I would love someone to knock on my door at 7 a.m. every day, so I put $1250 toward that. This exercise changes your mindset because you actually get to spend the money. It also gets you to dream and figure out what you want. It helps attract more money into your experience. This is also a trick from Ask and it is Given, Learning to Manifest Your Desires, by Esther and Jerry Hicks. To attract abundance, you need to feel abundant. This exercise is particularly awesome if you always feel short of money. 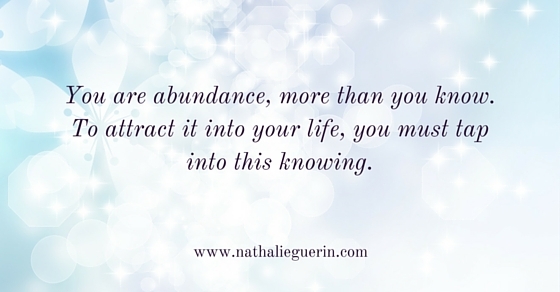 It will help you feel abundance. Put a $100 bill in your pocket. You aren’t going to spend it. Every time you see something you could buy, you instead tell yourself you could have it. For example, if you walk past a restaurant where you want to have dinner, tell yourself you could have dinner there. If you see a dress you like, tell yourself you could have it. One of the points Esther and Jerry make is this exercise removes doubt. You have a $100 in your pocket and you could do anything with it. It brings you in a place of feeling abundant. After you put this bill in your pocket, go out and find all the ways you could spend it. Keep it in your wallet as long as you have your wallet. The key to attracting what you want is to get into the right vibration. You need to feel good and then you will attract what you want. A great way to raise your vibration is to actually start the day with some positive mantras. All my bills are paid and it feels awesome. I have more money than I know what to do with. I’m so irresistible in business that my clients love me. My products help more and more people every day. My peeps love them. Repeat these three times aloud in the morning. It feels awesome. You really do start to feel better. You can also do them when you feel like you need a pick me up. Play the prosperity game and spend virtual money (it’s really fun and challenging). You can start feeling like you have money by putting a $100 in your pocket. And can start your day with mantras. These are easy to do and you don’t have to spend a dime to do them. But you do need to do them if you want to change your mindset. I used to fight these exercises. I used to read them and say “That’s nice.” I would do them once and then forget about them. Truth be told, that wasn’t enough. Now I do them every day. I start every morning with money mindset changes, which make a difference in my vibration and attract abundance faster than anything else. Now go try them. Don’t forget to let me know how it goes. http://nathalieguerin.com/wp-content/uploads/2015/05/BLOG-Image-32.jpg 292 560 nathalieg http://nathalieguerin.com/wp-content/uploads/2018/11/logo-black-watercolor-belini-300x194.png nathalieg2015-05-28 19:00:422016-06-04 03:38:54How do change your mindset when you don’t have a lot of money? HI Melissa. I’m so excited for you. Let me know how it goes.